The juggernaut of California’s table wine business, the Central Valley is the largest wine-grape growing region in the state. Sure the Central Valley’s most famous region has big-time, established wines. But the rest of the sprawling area is fast becoming a hot-bed for new producers. In 1922, Ernest and Julio Gallo’s parents bought a 20-acre vineyard ranch and farmhouse in Escalon, north of Modesto. The property grew Alicante Bouschet and Carignane and was successful enough during Prohibition, shipping grapes to home winemakers, that the family enterprise expanded. Already in Modesto was another prominent local grower by the last name of Franzia. The region extends for 400 miles, north to the farther reaches of the Sacramento Valley and south to Fresno County. But when most people think of the Central Valley, they think mostly of Modesto, of Gallo Hearty Burgundy and Two Buck Chuck. Inland, the Central Valley is hot with rich, fertile soils and miles of uninterrupted landscape, the perfect place to farm for high yields and juicy ripeness. To the east it is bordered by the Sierra Nevada, while to the west the Northern and Southern Coast Ranges prevent the Pacific Ocean’s cool influence from meddling too much. Where the ocean does enter is Lodi, which is why it has increasingly been taken out of most discussions about the Central Valley. The area has boomed since the 1960s but in more recent years has seen increased competition on two fronts. One has been from the rise in consumer preference for many of California’s premium wine regions, with people willing to pay more for quality wines. On the other hand, Central Valley growers are feeling increased price competition for their grapes from imports and wines from other parts of the United States, often made from less expensive fruit. Still, demand remains, particularly for the oceans of Chardonnay, Cabernet Sauvignon and Zinfandel the Central Valley can grow. Vintage 2012 was a record year for the region, which accounted for almost two million tons of wine grapes crushed, half of the state’s entire record yield. And planting continues. According to numbers from the Allied Grape Growers, a wine grape cooperative with 600 grower members in California, in 2012 there were 520,000 bearing acres of wine grapes in the state with an estimated 30,000 of them new. The vast majority of those new plantings are in the San Joaquin Valley. Chardonnay remains the largest single variety crushed in California, followed by Cabernet Sauvignon, Zinfandel and Merlot. Muscat of Alexandria, used primarily for Moscato production, also continues to rise, with tonnage crushed increasing 20 percent between 2011 and 2012. Fresno County accounts for most of it with 1,452 acres planted, half the state total. Both Central Valley Chardonnay and Cabernet are in high demand for box wines. The Central Valley is also where to find extensive plantings of French Colombard, Chenin Blanc, Pinot Gris/Grigio, Barbera, Syrah and Petite Sirah as well as Rubired, a U.C. Davis-developed hybrid of Alicante Ganzin and Tinta Cão; and Ruby Cabernet, a cross between Cabernet Sauvignon and Carignane. In addition to Gallo and Bronco, the Franzia family’s present-day concern, one of the valley’s biggest players is The Wine Group. The second largest wine producer in the U.S. by volume (world’s third largest) after Gallo, it sells some 60 million of cases a year. The Wine Group owns the original Franzia brand, as well as Almaden, Big House, Concannon, Corbett Canyon, Cupcake, Fish Eye and Glen Ellen, among others. The company buys 25 percent of its grapes from the San Joaquin Valley alone. Wine snobs would entirely dismiss Central Valley wines as generic and monolithic if it weren’t for Ficklin Vineyards and Quady Winery, two small, family-run outfits in inland Madera County devoted to making dessert and Port-style wines. Having produced his first Port in 1975, Andy Quady’s ability to make top-notch sweet and fortified wines from San Joaquin Valley fruit has served as a revelation to many—though he had to convince the area’s growers to take a chance with him on planting such varieties as Touriga Nacional and Tinta Madeira. Dubbed the Muscat King in the 1980s, Quady made the fortified dessert wine Essensia from Orange Muscat grapes, an elixir fully balanced in acidity and sweetness and a now favorite ingredient of mixologists. So is Elysium, his dessert wine from Black Muscat grapes. Meanwhile, the third-generation wine-maker Peter Ficklin nurtures Ficklin’s Old Vine Tinta Solera, blending his younger Port-style wines with old, some dating back to the winery’s earliest harvests in 1948. He also maintains the family’s 35 acres of traditional Port-grape varieties. Nicki Minaj has one; so does Nelly. Drake and Kanye West have sung its praises, too. It’s Moscato, a category of sweet white wine that’s become the fastest growing wine variety in the country—with sales recently blowing up 73 percent from year to year. It’s not only rappers who are into the wine. Gallo has introduced five new Moscato wines recently. Box wines offer value and quality in lighter packaging than bottles. They have become a growing business for wineries, especially many of the bigger entities based in the Central Valley. The Bota Box from DFV Wines based in Manteca has been especially popular, a line of wines in 3-liter and smaller Tetra-Pak boxes made from unbleached, recycled paper that are portable, shatterproof and recyclable. Equipped with a tap, the boxes are designed to keep the wine fresh for a month after opening. DFV confronts the hesitation some have about box wines on the box itself, saying buck the stigma and embrace the box. Its selection of wines is vast—from Pinot Grigio, Riesling and Chardonnay to Merlot, Malbec, Zinfandel and Cabernet Sauvignon. Black Box is another frequently seen box wine; its Merlot and Pinot Grigio are especially popular, while Bandit’s little Tetra-Paks of Pinot Grigio, Cabernet Sauvignon, Merlot and Chardonnay are the ideal size to take for a picnic. Planted throughout this warm region, the fruit tends to take on ripe tropical fruit characteristics, given shades of butter and toast from its time in oak. Central Valley’s warmer climate produces full-bodied Zinfandels, some from older vines, rich and juicy in blackberry flavor, with a hit of acidity on the finish. Medium-bodied with soft tannins and flavors of plum and berry, Merlot continues to be a widely planted red grape, its moderate acidity used to tame Cabernet. Juicy, light and often made in sweet, pink or sparkling styles, this is the “It” grape of our time, a peach and pineapple-flavored quaff best served cold. Refreshing and fairly crisp, people have taken to Pinot Grigio’s unfussy lightness of being, its array of melon and apple flavors and low acidity. Season steaks on all sides. Take notice of the meat graining and place on grill going the same direction. Cook on each side twice for two minutes turning steaks 45 degrees each time. Middles should read 125°F; if not, place in a 350°F oven for a few minutes until it does. Rest the meat for 5 minutes in a warm place. Slice against the grain for presentation. In a large sauté pan, melt the butter and add the mushrooms and shallots. Sauté until browned. Deglaze with Madeira and reduce until dry. Stir in flour and form a paste (about two minutes’ cooking). Add half & half and stir until incorporated. Season with salt and pepper. It is finished when sauce is just barely thick. Peel and quarter potatoes and place in an 8-quart pot. Fill to an inch above the potatoes and put over high heat. Bring to a boil and then reduce heat to a simmer. Cook for 10 to 15 minutes or until potatoes are fork tender. Remove from heat and strain. In a small sauté pan melt butter; do not allow to bubble. Add the rosemary. Let sit at the lowest heat for 5 minutes. Do not allow it to foam. Place butter and rosemary mixture in a large mixing bowl. Whisk in Kosher salt, egg and baking powder. Rice the potatoes into the mixing bowl. Fold ingredients until well combined. A ¼-cup at a time, work the flour into the potato mixture being careful not to over-work. Once all of the flour is roughly mixed in, turn dough out onto a lightly floured clean working surface. Knead dough for two minutes until it is smooth. Wrap tightly in plastic wrap and refrigerate for 30 minutes. Portion dough into 8 pieces. Roll dough between your hands and work surface until it is a half-inch thick, lightly flour if the dough sticks. Cut dough into half-inch pillows and reserve on a sheet tray dusted with flour to prevent sticking. Bring an 8-quart pot of water to a boil and season with salt until it just barely tastes like the ocean. Place gnocchi into the water and set a timer for 2 minutes. Once the gnocchi surfaces start the timer. Remove gnocchi with a slotted spoon or spider. Peel and slice the onions about a ¼-inch thick. Heat the olive oil blend in a large heavy bottomed pot or rondeau. Add onions and sugar and stir until they are just beyond golden brown. Deglaze with red wine and continue to stir until wine is nearly evaporated. Season with salt and pepper. Cook in more sugar if needed. Pot filled 1-inch deep with any type of frying oil at 325°F. Preheat oven to 200°F. Slice shallots into thin rings. Place cornstarch and salt into a zip lock back. Add shallots and seal. Shake until all of the shallots are covered. Prepare a draining tray (sheet pan lined with paper towels). Transfer shallots to the fryer oil. Allow to fry for 2 to 3 minutes until lightly browned, transfer to the draining tray. This may need to be done in several loads depending on the size of your frying pan. Once drained, transfer to a new baking sheet and place in the oven to continue to dry for about 10 minutes. Put the gnocchi first in the center of the plate. Place the red wine onions off to the left or right of the gnocchi. Place the sliced flat iron over the gnocchi and garnish the top of the flat iron with the crispy shallots. The imprint of Italian heritage persists throughout the Central Valley, from the restaurants in Modesto owned by folks who share the last name Gallo to the small pizzerias and trattorias from Madera to Bakersfield. A onetime railroad stop, Clovis is lovingly referred to as the “Gateway to the Sierras.” Set in historic Old Town Clovis, Trelio Restaurant and Wine has been run by the Shackelford family since 2006. Chef Mike Shackelford has been behind the stoves and brother Chris expertly compiles an impressive wine list, undoubtedly among the best in the region. Together they renovated the small brick building into a classic-looking space to match the timeless feel of the town around them. The cuisine ranges from Creole and Cajun to French and Italian. Nothing is off-limits when it comes to creating new dishes for the daily changing à-la-carte menu, Chris Shackelford says. The restaurant opens for dinner only. One of the restaurant’s favorite purveyors is SunSmile Farms in Grass Valley, a 70-acre certified organic farm in business since 1939. Trelio’s wine list stocks 400-plus labels with an emphasis on hard-to-find wines from all over California, in addition to many notable wines from throughout the world. Pricing hovers just above retail with free corkage offered too. Among locally made wines Shackelford is quick to single out Westbrook Wine Farm in Madera, under the direction of owner/winemaker Ray Krause, as one of his favorites. “His Museum Cabernet—from a one-acre vineyard of clippings from all the greatest vineyards in Napa—is amazing for the price and the region” says Shackleford. Indeed. Westbrook’s Museum Vineyard is planted with seven heritage clones of Cabernet Sauvignon and one clone each of Gros Verdot and Malbec, trained to the ancient spur-pruned vertical cordon. Serious stuff. Krause then harvests and co-ferments the grape varieties together. “Krause does really great and important things in the Central Valley,” notes Shackelford. “He also makes this great dry Riesling and a must-try Sauvignon Blanc, too. CandyCots: An apricot developed by Driver Family Farms near Modesto, CandyCots originated from Central Asian apricot seeds and have double the sweetness of a typical American apricot and often fuzzless skin. Clingstone Peaches: A Clingstone peach has flesh that adheres to the pit, different than a Freestone, whose stone and flesh separate when the peach is ready to eat. Red Walnuts: Sanguinetti Family Farms outside of Stockton grows rare red walnuts, the result of grafting Persian red-skinned walnuts onto creamier English walnuts. 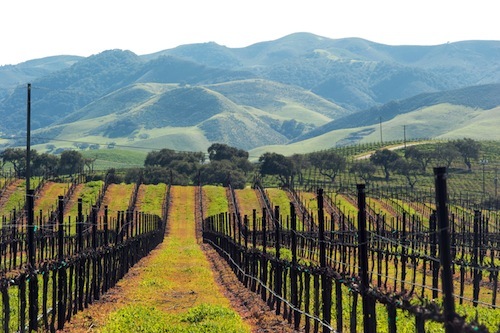 Beyond the vineyards, look to the east and you’ll spy one of the Central Valley’s stunning backdrops. The Sierra Nevada home to Yosemite and Lake Tahoe. At Tahoe, resorts cater to visitors—whether in snow season or the glorious summers and falls—who enjoy a fine meal and a fine wine. Start at The Village at Northstar, which hosts an annual Autumn Food and Wine Festival in September. PlumpJack Squaw Valley Inn boasts great wines on the list, and the PlumpJack Café also organizes spectacular seasonal wine-tasting dinners. Claiming to be the state’s highest and coldest vineyard site, the Truckee River Winery grows vines along the Truckee River. It produces wines from grapes grown both nearby and as far away as the Santa Lucia Highlands. In summer it features bocce lessons and a Full-Moon Glow Ball (the bocce balls light up) plus other events throughout the year. At Yosemite, the views won’t be the sole source of your swooning. Bartender Chris Dooley enjoys being in what he terms “the farm-to-fork capital of the country.” When mixing up his quintessential Sacramento cocktail, he uses local lemon and mint, plus strawberries grown in Ella’s backyard. It’s a party, so have fun. Allie Quady Shaylor shows you how. Allie Quady Shaylor was raised at her parents’ winery in Madera. During the 1990s, her father, Andy Quady, became known as the Muscat King after persuading Central Valley growers to grow Muscat for his dessert wines, Elysium and Essensia, in addition to grape varieties traditionally used to make Port. The Quadys also produce Vya Vermouth in both sweet and dry versions. Shaylor is helping the family leap into the cocktail world, crisscrossing the country to promote their tasty wares. She also has two Quady cocktail recipe books, free online. Classic jazz for classic cocktails: Art Blakey’s Serious Business, Charles Mingus’ Mingus Mingus Mingus or change it up with Herbie Hancock’s Maiden Voyage. Extra-dry martinis made with Vya Vermouth garnished with olives, and paired with gravlax. And 50:50 Manhattans: equal parts whiskey and vermouth, paired with the meatballs. Place half the fish, skin side down, in a glass, enamel or stainless steel dish. Dish needs to be deep enough to hold both layers of the fish and platter to cover fish inside the bowl. Wash, shake dry the dill bunch and place on the fish. In small bowl combine the salt, sugar and crushed peppercorns. Sprinkle mixture evenly over the dill. Top with other half of fish, skin side up. Cover with aluminum foil. Set a platter atop aluminum-foil covered fish filets and pile the platter with weights—three to four cans of food work well. Refrigerate 48 hours or up to three days, turning fish every 12 hours and basting with the liquid marinade that accumulates. Separate the halves to baste salmon inside and turn the salmon over and replace platter and weights each time. When finished, remove the fish from marinade and separate halves. Scrape away the dill and seasonings and patdry with paper towels then place skin side down on carving board. Slice salmon halves thinly on the diagonal, detaching from the skin. Serve with mustard-dill sauce, lemon wedges, small toasts or thin rye bread and a lettuce salad. Serves 8–10. In small deep bow or electric hand blender mix two mustards, sugar and vinegar to paste. With wire whisk slowly beat in the oil until the mixture forms a thick, mayonnaise-like emulsion. Stir in the chopped dill. Refrigerate in small jar until ready to use. Shake vigorously or beat with whisk before serving. You can make this several days ahead. Makes about 1/2 cup. Scrub cucumbers and dry. Score lengthwise with a fork. Cut them into thinnest possible slices. Arrange in thin layer in shallow glass dish. Sprinkle with salt. Place weights on top to press out excess water and bitterness. Leave at room temperature for a few hours or overnight in refrigerator. Remove plates and drain cucumbers of all liquid. Wash slightly to remove excess salt, pat dry and return to dish. For vinaigrette: In small bowl, beat together vinegar, sugar salt and pepper. Pour vinaigrette over cucumbers and strew with chopped dill. Chill for two or three hours up to overnight. Just before serving, drain away nearly all the liquid. Serves 4 as salad or more if accompaniment to gravlax. Melt 2 tablespoons butter over moderate heat in heavy 10- to 12-inch skillet. Add onions and garlic, cook for about five minutes until soft and translucent but not browned. Scrape contents of skillet into deep bowl. Add ground meat, pork, breadcrumbs, egg, milk, parsley, thyme, salt and pepper to the bowl. Knead vigorously with both hands to incorporate all ingredients. Beat mixture with wooden spoon until smooth. To shape meatballs pinch off about 1 tablespoon of mixture and roll between hands into ball about 1 inch in diameter. In skillet, melt 4 tablespoons butter with oil and brown the meatballs, 10 or 12 at a time. Turn balls frequently and regulate heat so they color evenly without burning. With slotted spoon transfer to plate when brown and add more meatballs. When all meatballs are browned, pour off remaining fat in skillet. Add chicken stock to skillet and bring to boil over high heat, scraping in any browned bits from meatballs. Return all meatballs to the skillet with any liquid accumulated around them on the plate. Reduce heat and simmer partially covered for 20 minutes or until no trace of pink when pierced with knife. With slotted spoon remove meatballs to heated bowl and cover to keep warm. For sour cream sauce, beat sour cream, flour and mustard together with a wire whisk in a bowl until well blended. Add the sour cream mixture to liquid remaining in skillet. Whisking constantly, cook over low heat for four to five minutes until sauce is smooth and lightly thickened. Taste for seasonings. Pour meatballs and sauce into heated chafing dish and stir. Place toothpicks or small forks with chafing dish for guests to serve themselves. Makes about 4 dozen 1-inch meatballs.